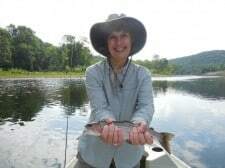 « Working For Those Trout! We have seen some much-needed rain the past few days. Actually cancelled a trip Monday because of the heavy lightning. Today, we are expecting mid 80s by noon and upper 80s for the day. This will be pretty much the same forecast through the coming weekend. By early next week, the temperatures will rise back into the 90s. Not a whole lot of change in the generation patterns. Over the past three days, we have seen low generation in the mornings instead of no generation. They are still running 2-3 generators every afternoon. I really doubt that this pattern will change much over the next few days. Not a bad day for the Louisiana Kerrs last Thursday. 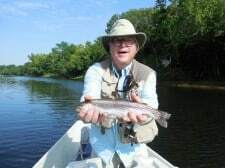 James Albert spent the day with Jim working streamers and pulled a respectible number of fish on these. Carolyn had Dawn and Albert. They too had a good day on the CQ streamer, copper dun, black copperhead and P&P midges. Friday Stan took Doc from Oklahoma out for the day. Slow bite on the copper dun and P&P midges. No generation and temperature was near 100….I’d lay low too! Scott and Adria spent all day Saturday on the water with Jim. It was a size 10 CQ streamer day, mixed with the P&P and gold head olive midges, and dark gray scuds. Good day for these two. Meanwhile, back at the ranch, the rest of the crew had a group of new fly fishers from the Leawood, Kansas Orvis store who were taking the Orvis 301 Clinic. This was a full day of actively learning and fishing. Stan had Mark and Becky from Blue Springs. Good day for these two on the copper dun, big ruby (when the water came on) and the P&P midges. Jim from Columbia, spent the day with Darrell. Their best pattern was the CQ streamer. It was streamer work for Jim! Dana had Toni and Dan from Warrensburg. Not a bad day on tha tab b-bug and a black midge. Carolyn had Dan and LuAnne from Kansas City. Although they caught fish on the copperhead black zebra and copper dun midges, the CQ streamer was the most consistent pattern for most of the day. Once the water came on, it was a big ruby with a red San Juan worm or a peachy king egg pattern along the high back on our drift out. from Kansas City. This was one of those “whoever sits in the front of the boat” days. Marianne could do no wrong. Yes, we let Ralph catch some fish too! Good day for these two on the copperhead black and rusty midges. Fished the rise with the big ruby midge and a red San Juan dropper. At least two doubles for Ralph and Marianne. Crazy weekend! 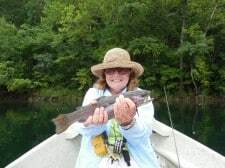 This entry was posted on Wednesday, July 24th, 2013 at 9:43 am	and is filed under Fishing Reports. You can follow any responses to this entry through the RSS 2.0 feed. You can leave a response, or trackback from your own site.